A stunning debut about a magician's apprentice and a one-winged princess who must vanquish the mechanical monsters that stalk the streets and threaten the faerie kingdom. Aspiring inventor and magician's apprentice Felix Carmer III would rather be tinkering with his latest experiments than sawing girls in half on stage, but with Antoine the Amazifier's show a tomato's throw away from going under, Carmer is determined to win the cash prize in the biggest magic competition in Skemantis. When fate throws Carmer across the path of fiery, flightless faerie princess Grit (do not call her Grettifrida), they strike a deal. If Carmer will help Grit investigate a string of faerie disappearances, she'll use her very real magic to give his mechanical illusions a much-needed boost against the competition. But Carmer and Grit soon discover they're not the only duo trying to pair magic with machine - and the combination can be deadly. 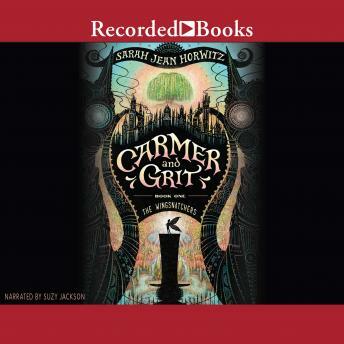 In this story perfect for readers of the Lockwood & Co and Wildwood series, Sarah Jean Horwitz takes readers on a thrilling journey through a magical wooded fairyland and steampunk streets where terrifying automata cats lurk in the shadows and a mad scientist's newest mechanical invention might be more menace than miracle.